Controlling access in your helpdesk is important for any business. If you are like most businesses, you may have a hierarchy structure as to what your managers should have access to things that your agents should not be able to access. With Trakdesk roles and permissions in place, you can create permission groups and configure specific access for each of them. These groups will help you to categorise your agents and teams into different sections, and with specific permissions so that they can do what they need to do in your helpdesk without limitations. Select the Roles & Permissions option. At the Top Right of the page, click on the drop down menu and select Add Permission Group. Once the popup modal has opened, enter a unique name and a brief description for the permission group and click on the submit button. 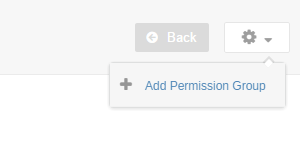 After the group has been successfully added, you can then edit the group and assign the appropriate permissions. Note: By default, all permissions for new groups are disabled. This means you will have to go through each module to set the appropriate permissions. Configure the permissions that you would like to be assigned to the group and click on the Save Changes button. Thats all, your permission group with specific access has been setup. Now you can assign the group to an agent account. Note: Permission groups can only be applied to group access agent accounts.